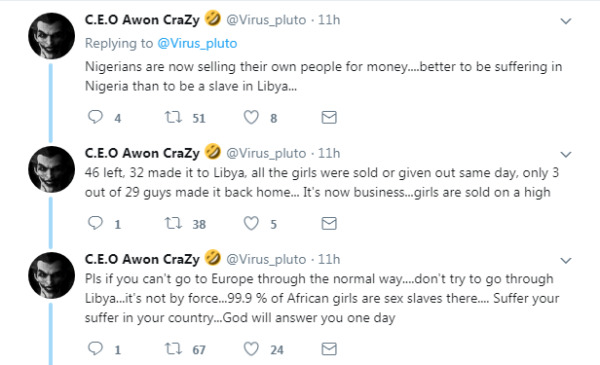 A Twitter user @Virus_pluto has said that Nigerians are involved in the auctioning of migrants off as slaves in Libya. 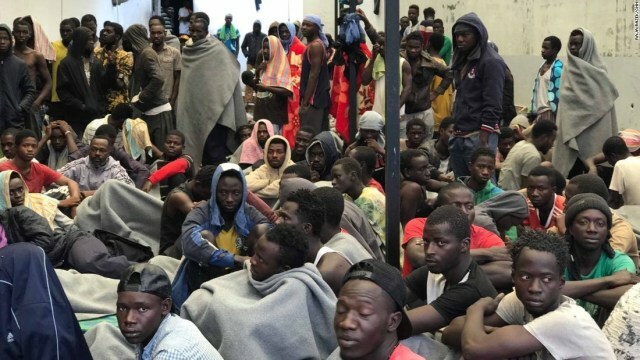 News about “slave markets” (in North Africa, particularly Libya) where Nigerians and other Africans are being sold for $400 or less have been making the rounds after a CNN report was published. The Twitter user, on his timeline, shared a thread on a friend who attempted crossing from Africa to Europe but was sold off as a slave instead. The friend eventually found his way back to Nigeria, he wrote, but not before he was sold twice, raped, beaten and abused. The friend was one of 32 who arrived in Libya in July 2016, out of 49 who left Nigeria. All of the girls were sold, he wrote, and only 3 of 29 boys made it back home.